Canadian Book Challenge II, eh? 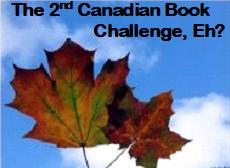 The 2nd Canadian Book Challenge is hosted again by John of The Book Mine Set. I didn’t know about it the first time round, but now I plan to participate … and I have just the set of books in mind! My category: The Prize Pack & The Provincial/Territorial because at my summer job, also in the office is the BC Book Prizes. This means that there are many books at my fingertips to borrow (and take good care of)! BONUS: Steve Zipp is sending me a copy of Yellowknife, his novel! I’m very excited to receive this and to add it to my challenge… it just doesn’t fit into the categories I chose, so it’s a BONUS! All I’ve read on this list is The 100 Mile Diet (quite good, by the way) – I’ll have to add the others to my reading list!